The responsible conduct of investee companies is a key consideration for investors, as adverse impacts of business activities on workers, communities and the environment can cause material risk to investments, while the proactive mitigation of negative impacts presents opportunities. Public scrutiny of irresponsible business conduct has increasingly widened from companies to their investors. Last month, the Organisation for Economic Co-operation and Development (OECD) released its Responsible Business Conduct for Institutional Investors, its most specific guidance yet for the finance industry’s efforts to integrate established ESG expectation into its management systems. Built on the OECD Guidelines for Multinational Enterprises, the practical guidance explains that even with minority shareholdings, investors may be directly linked to adverse impacts caused by their investee companies by virtue of their ownership in – or management of – shares in that company. The implications are significant for investors, as they hold, through their investments, business relationships with a vast and varied array of companies, along with the associated ‘direct linkage’ to potential and actual human rights and environmental impacts. What are the most significant voluntary and regulatory initiatives driving responsible investment? What were the drivers for the new guidance for investors? Why are investors expected to “know and show” their contribution to sustainable development? What are the benefits of assessing and taking into consideration responsible business conduct in investment decision? 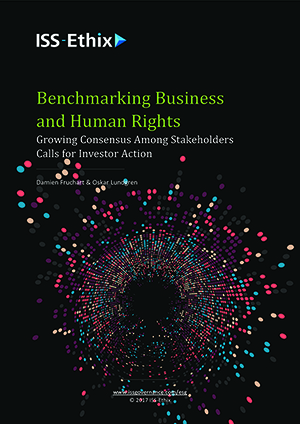 To learn more about the factors to consider when understanding risk from human rights controversies across your portfolio, download the ISS-Ethix study, Benchmarking Business and Human Rights: Growing Consensus Among Stakeholders Calls for Investor Action.